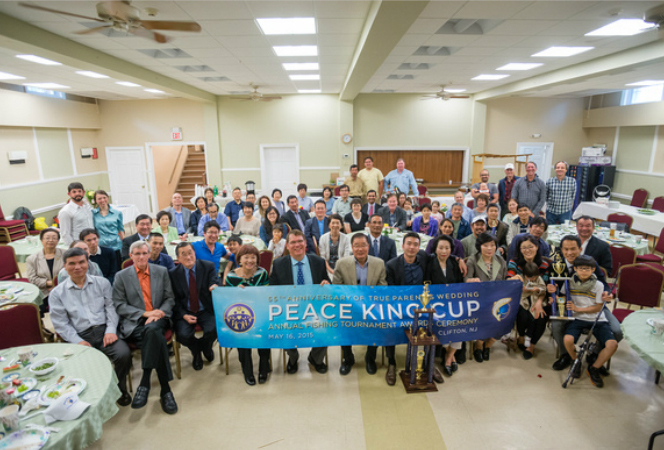 FFWPU USA: The Annual Peace King Cup Fishing Tournament concluded on Friday, May 15, 2015 after eight days of great catches. The awards ceremony for the winners was held on Saturday, May 16 at the Clifton Family Church in New Jersey. Over 75 people attended to celebrate True Parents’ 55th Holy Wedding Anniversary and a week of fishing along the Hudson River. The grand prize of $3,000 and a trophy was awarded to Mr. Jin Hyung Kim, whose bass measured 45 inches and 28.5 pounds. In second, third, fourth and fifth places were Kevin Sato, (39″ and 24.9lbs), Hideo Maldonado, (38.5” and 22lbs), Koshiro Kawasaki (38.5’ and 21.5lbs) and Yosuke Mizuguchi (38” and 19.2lbs). The awards ceremony started with a delicious sushi luncheon by chefs Kenritsu Sato and Wataru Takebata. Emcee Naria McGee gave a brief introduction on the tournament. Continental Chair of Family Federation for World Peace and Unification (FFWPU) Dr. Ki Hoon Kim gave the keynote speech, sharing his experience in the fishing tournament and its deep meaning. He gave away the awards, together with FFWPU USA President, Dr. Michael Balcomb. Dr. Balcomb gave the congratulatory message to the winners as well as to all the participants.